Our treadmill FAQs are meant to address the most frequently asked questions regarding treadmill use. We’ve focused on problems or questions that can be easily answered, including possible ways to fix problems, without contacting a treadmill repair service. If you have a more complex problem, we encourage you to look for the treadmill FAQs in your user’s manual or visit the website for your particular treadmill make and model. What is the proper environment for my treadmill? Treadmills are designed for normal household use. This means the humidity should be below 90% and temperatures should range from 55˚ Fahrenheit to 90˚ Fahrenheit. Does my treadmill need regular maintenance? This is one of the most frequently ignored of the many treadmill FAQs. Proper care of your treadmill on a daily basis is crucial to optimal operation, yet many users ignore our advice. Please, if you want your treadmill to give you years of reliable operation, always take a few minutes to care for it properly after use! ICON Health & Fitness FAQs - Answers to questions regarding consoles, walking belts, heart rate control, maintenance and warranties on Epic, Freemotion, Gold's Gym, HealthRider, Image, NordicTrack, ProForm, Reebok and Weslo treadmills. Invest in a treadmill mat: a full-length rubber mat placed underneath your treadmill prevents dust and lint from getting sucked up by the belt and drawn into the motor housing. You should wipe down the machine after every workout with a damp cloth to remove sweat. The salt in sweat is corrosive and can cause rust or damage to wiring over time. Follow the routine maintenance schedule recommended in your owner’s manual. This should include a cleaning, inspection and any needed adjustments. Every few months, unplug your treadmill and remove the hood cover. Use the attachment on your vacuum cleaner to gently remove dust and debris around the treadmill motor and elevation assembly. Do NOT hit any sensors or loosen any wires. If the exterior of your treadmill gets dirty, wipe it down with a soapy cloth using a mild dish soap. Never spray cleaning solvent on the console; simply wipe it with a rung-out, damp cloth. Do I need a surge protector for my treadmill? This is one of the treadmill FAQs that is simple to answer – YES. You can seriously damage your treadmill without a surge protector. Why do I get a static shock when using my treadmill? When you’re on a treadmill, static electricity naturally builds up in your body, especially in the winter when the air can be very dry. The electricity is generated by the friction between the deck and the running belt. Try raising the humidity in the room (a portable humidifier can help) or spraying your clothing with an anti-static spray. Wearing natural materials such as cotton can also help; nylons and synthetics often accumulate static charge. Why won’t my treadmill turn on? Is the power switch turned on? Is the treadmill firmly plugged in? Is the power outlet still live? Try plugging in another appliance to see if it works. Check the fuse or circuit breaker to make sure you haven’t blown a fuse or tripped a breaker. 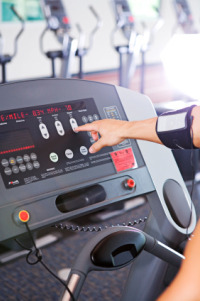 Be sure the treadmill is unplugged and turned off, then check for loose wires or cables. If you still can’t find the problem, contact the customer service department for your particular treadmill for guidance. You might also contact a reliable repair service, such as Treadmill Doctor. They walk customers through hundreds of treadmill FAQs every year. Can I use a heart rate monitor if I have a pacemaker? Don’t ever use any kind of heart rate monitor without discussing it with your physician. Some heart rate monitors may affect the performance and function of a pacemaker. What should I do if my console reads only zeros? What do I do if the belt stops when I’m walking on my treadmill? It could be a worn belt, or the area may need lubrication. Check your user’s manual or call customer service for your treadmill model for guidance. This is one of the easiest treadmill FAQs to remedy. It’s usually simply a matter of making sure the contacts with your skin are strong. Make sure the heart monitor(s) are next to the skin and firmly secured. Use either saline solution or saliva to wet the electrodes on the sensor unit. If they still don’t work, try positioning them higher or lower on your chest. Remember to walk toward the center of the belt rather than along either side. If you still aren’t getting a reading, try relocating your treadmill. Sometimes interference from a magnetic source such as overhead power lines can affect performance. The heart rate monitor won’t work correctly if you have heart arrhythmia, tachycardia or a medical condition referred to as PVCs (premature ventricular contraction). Why can’t I get a reading from the hand grip pulse sensor? The contacts may be dirty. Try cleaning the metal sensor pads with a damp cloth. Make sure when you grip the bars, your hand is around both the upper and lower plates of the pulse sensor. If you still don’t get a reading, try resetting the console. Unplug the machine, leaving the safety key (if applicable) in place. Wait a full minute, then plug your treadmill in. Remove your safety key, then reinsert it. Now try your hand grip pulse monitor. If it still doesn’t read properly, contact customer service or a licensed treadmill repair service. Why am I getting a repeating pattern on my console? This usually means your console is still in Demo mode. You should only see this when your treadmill is turned on but the safety key isn’t inserted. Press and hold the STOP key while inserting your treadmill safety key. Press the SPEED key to turn the mode on or off. Once you’ve reset the mode, just pull out the safety key. This does vary slightly from model to model, so consult your user’s manual for guidance if the above directions don’t work for your particular treadmill. If you haven’t found the answers you need in our treadmill frequently asked questions, consult your user’s manual or contact a licensed repair professional. You may also find additional treadmill FAQs on the company website for your brand of treadmill.